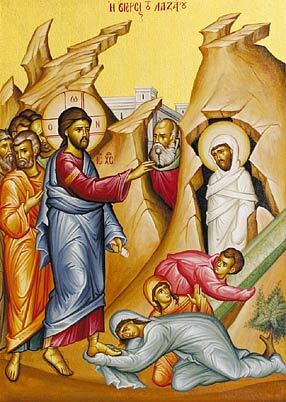 For Orthodox Christians, today is Lazarus Saturday. We don’t celebrate Easter until next week, but the raising of Lazarus gives us a glimpse of Christ’s own rising from the dead a week later, and of our own coming resurrection. This year I am a sponsor/godmother to a catechumen who will be baptized a week from today; last night I attended the last of her classes with her, and listened in on the explanation of all the services to come this week, and their meaning in our lives. I was reminded of my own baptism five years ago, and also filled with joy in remembering and anticipating the many stops along this last stretch of the journey to Pascha. The liturgical landscape is marked by beloved hymns and prayers I have sung year after year, and which will bring me into the shining presence of Christ again, by His grace. It’s easy to be emotional today, even thinking about an experience that is not primarily emotional, because I am housebound for a relatively minor disability, and have to miss a few services this coming week. So I’m feeling sorry for myself, but trying to be thankful at the same time, and accept all the blessings God is giving me. When God is constantly pouring down love and blessing, it’s easy to get overwhelmed or confused. One day, the blessings look to any passerby to be good fortune, and another day, it takes a discerning eye to see Him, and be at peace. Even in the church services there are so many “things” going on that I can never attend to them all at once. One time I notice a particular hymn and how it blends perfectly into the whole message of the day; another time I spend most of the service in a battle just to return again and again from my distracting thoughts. In my large parish we have numerous opportunities to participate in the services held, especially during Lent and Holy Week. I’m sure there is no one who can attend all of them, even the priests. Because circumstances change, including the circumstances of our own hearts and health, every Lent is at least a little different in how God deals with us. The upcoming week is part of that reality of having to live day-by-day and moment-by-moment, in thankfulness. Whether you celebrate tomorrow or next week, may your celebration of the Resurrection be a glorious feast. Many years to the newly illumined! I like your thoughtful post. I hope you feel better this week and may Easter bring you many blessings. I loved this post. I do hope you are feeling better. Happy Resurrection Day. Your post is a blessing, as always. Praying for you in your “slight affliction”. Wonderful thoughtful post as always. I find the Easter 'holidays' a little difficult, as there is was so much suffering and sadness — seems kind of strange to celebrate by running around hunting eggs and chasing bunnies.